Home theater systems and such have become a widespread phenomena. As technology becomes more and more affordable and even the low end systems have the juice to keep up with HD and Blu-Ray playback, there has never been a better time to buy one of such systems. At the expense of sounding like some sales commercial, I really do believe that it is in fact true. One could either spend money buying different parts of a home entertainment system like a Blu-Ray player, Tivo, etc, or for about the same price get an HTPC which has all that functionality, and still has access to your Facebook account. 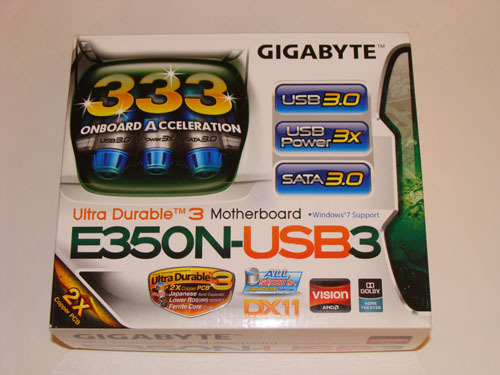 This is where Gigabyte’s E350N-USB3 comes in. 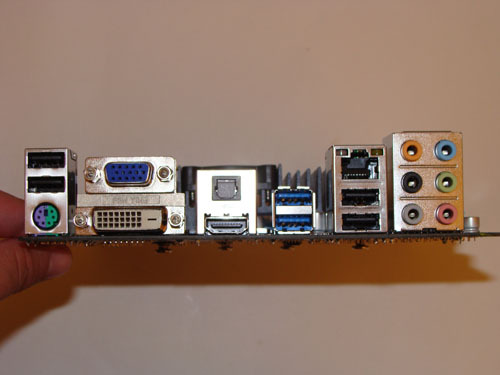 This board already comes with its own processor, so the only things that are required are hard drive, RAM and a power supply and essentially you are good to go. Gigabyte is not alone in the market, however, Intel based boards such as the JNC98-525-LF on the proven ION2 platform are also in the race. Does the E350N stack up to it competition? Read on and find out. Packaging is as appealing as ever and follows Gigabyte’s styling concept almost to the ‘T’. The words “Ultra” and “Durable” are spread all over the back, the front and all the other sides of the box. On the back there are 6 I counted 6 instances of the word “Ultra” while the front contained only 2. Aside from that the packaging looks crisp and got my attention pretty well, it would definitely be something I would take a look at if it was on the shelf at my local electronics store. 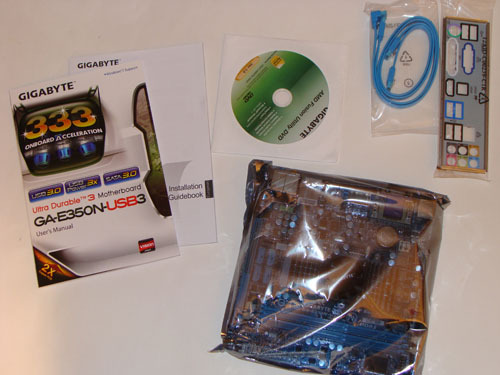 The contents of the package are as follows: The E350N-USB3 Motherboard, a Drivers DVD, installation and user manuals and 2 SATA III cables. Both the motherboard and the cables are colored Gigabyte Classic light blue. The E350N-USB3 contains a total of 1 PS2 (Mouse/Keyboard) port, 4 USB ports, 1 VGA, 1 S-Video, 1 HDMI, 1 Optical audio out, 2 USB 3 ports, and 4 USB 2 ports in addition to the standard analog 5 channel analog audio out and the standard 10/100/1000 Base Ethernet connector.